In December 1995 Jean-Dominique Bauby, Editor-in-Chief of French magazine Elle, suffered a massive stroke and became the victim of “Locked-in Syndrome.” Unable to move anything other than his left eyelid, he collaborated with book editor Claude Mendibil on his memoir, dictating by blinking his left eye. He died two days after the book was published. This film is unique proof that personal tragedies really can inspire. It’s nearly impossible to imagine the will power it took for Bauby to dictate his memoir literally blink-by-blink. The result is a gloriously wry description of his inner world. 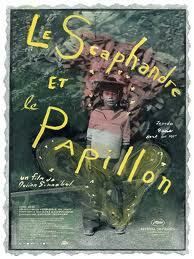 Equally wonderful is how Director Julian Schnabel (Before Night Falls) realises this film. Much of it’s shot through the perspective of the left eye of bedridden Bauby, though we sometimes see external shots of Bauby with his family and friends, as well as memory sequences of Bauby pre-stroke. Through voice-over we hear the words that are in Bauby’s mind but which never pass through his lips. This film, like its subject, is brave. We leave it full of admiration for Bauby’s mental vivacity (the ‘butterfly’) and his physical limitations (the ‘diving bell’), as well as some understanding of what it means to be alive. hiya. really like the site. we have been watching the black swan and i wanted to know what you thought of it? would be good to know.